I have accepted free Fandango promotional codes from Fandango in exchange for this feature. No monetary compensation was received. A movie with pets and you just can't go wrong, right!? The Secret Life of Pets has been topping the box office. We have been waiting for this movie to come out, one we've really been looking forward to. I'll be honest, we haven't seen it yet. We had a death in the family and that's been keeping us busy. So while I can't give a review of the movie, I can join you in the excitement of seeing the movie! The Secret Life of Pets is also shown in 3D which always makes any movie more fun to see! 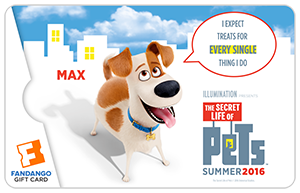 The Secret Life of Pets is about Max; a spoiled terrier who enjoys a comfortable life in New York until his owner adopts Duke - a giant and unruly canine! While they are out on their walk they run into a group of alley cats and end up in a truck that is on it's way to the pound. Luckily for them, a rebellious bunny named Snowball is there to save them from ending up in the pound. But, Snowball wants something in return - Snowball wants Max and Duke to join his gang of abandoned pets on a mission against the humans who have done them wrong. Check out this cute video of a 7 year old interviewing the cast! In celebration of the movie's release, fans can now buy these fun collectible gift cards from Fandango. Available in both digital or physical form at fandango.com/giftcards. Fandango is giving one of our readers a $50 Fandango Gift Card. Giveaway is open to U.S. residents only 18 years of age and older. Prize fulfilled by Fandango.